Of course, many never saw the road at all, and lights, signals, and other equipment were quickly boxed up to prep the bikes for race-duty. Or display. 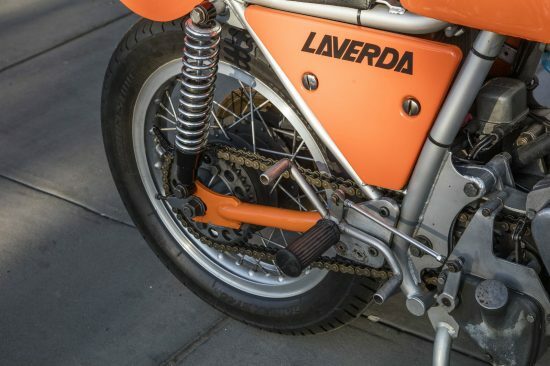 The basic Laverda parallel twin made for a pretty good foundation for racing. It wasn’t particularly light, but the bike was stiff and very stable, ideal for endurance events. And the engine featured five main bearings for exemplary durability, as the bike in stock form was fairly under-stressed. Stuffed full of factory high-performance goodness, the SFC made 80hp while retaining the standard bike’s rock-solid handling. 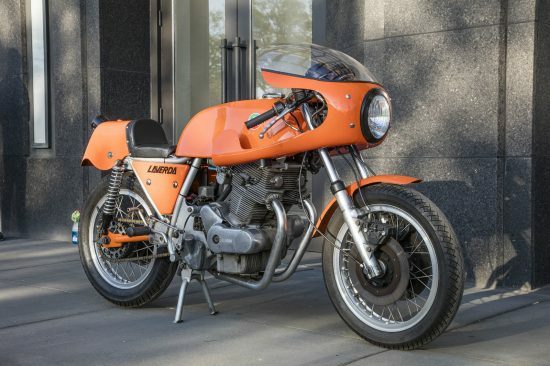 The example offered here is an excellent example of the US series 1974 Laverda 750 SFC and comes with a known and documented history. 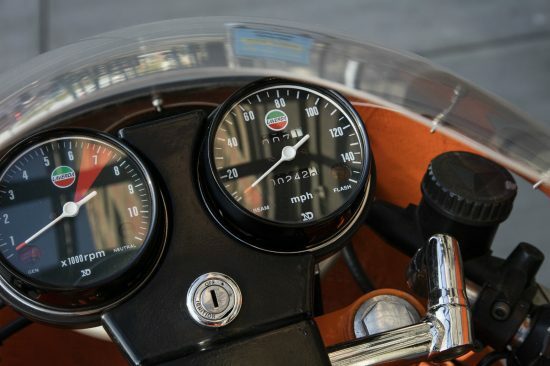 Although it has been slightly modified from original, with a smaller European taillight, Verlicchi twin cable throttle, and no turn signals and reflectors, the sporting soul remains intact. The late 1950s and early 1960s was not a great time for Italian motorcycle manufacturers. As Italian industry was heavily protected and imports restricted, motorcycle manufacturers survived in a false world where most of their products were consumed by the domestic market. When domestic demand collapsed so did much of the Italian motorcycle industry. 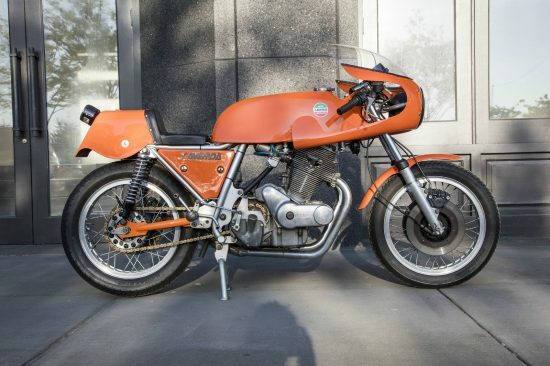 Laverda struggled during this period but Massimo Laverda saw a way out, and that was targeting the huge American market. Massimo was a motorcycle enthusiast, already aware of the move to towards motorcycling as a means of fun and enjoyment instead of basic transportation and was convinced the future lay in large capacity, more sporting machines. Knowing he didn’t have the resources to develop an engine from the ground up, and not wanting to emulate obsolete British designs, Massimo looked at what Honda was doing. Honda released their 305cc CB77 parallel twin “Super Hawk” for 1961 and as this overhead camshaft unit construction engine with horizontally-split crankcases was already proving considerably reliable, Laverda essentially enlarged and strengthened the Honda engine, initially creating a 650, before releasing the 750 in 1969. 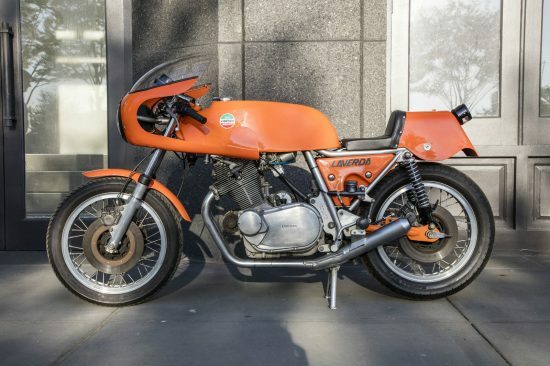 In long distance endurance racing during 1969 and 1970 the 750 S and SF established Laverda’s reputation for robustness and exceptional all round performance and for 1971 Laverda created the 750 SFC (C for Competizione). The bright orange color scheme of the factory racers became an SFC trademark. Although it was always a limited edition model, even after 1973 when the factory stopped racing the 750 twin, the SFC continued, incorporating many of the developments learnt from three successful years of racing. The 750 SFC was thus a true racing machine, built to the highest standards, that could be ridden on the street and a limited edition replica of a successful factory racer. Few components were shared between the SFC and regular SF, and only in 1974 did production exceed 200 a year. 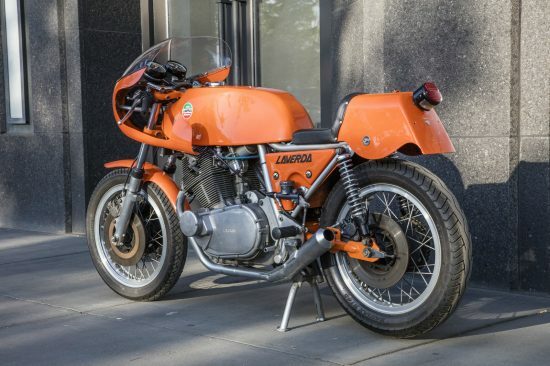 For 1974 Laverda released an updated 750 SFC, primarily for Italian 750cc production-based racing, one of the leading domestic racing categories. Success in 750 racing was seen as very important publicity and the updated 750 SFC differed considerably in design and concept to the earlier drum brake versions. It was now substantially different to the 750 SF and designed with 750 class production racing in mind rather than endurance racing. Incorporating many developments of the 1973 factory bikes, the 1974 750 SFC was one of the outstanding sporting machines of the era. With its low frame and sculptured looks the 1974 750 SFC was also a styling triumph. There was also a specific US version this year but while these North American examples were slightly different in equipment the engine and chassis specifications were the same as the European model. Just 549 of these were made over the short production run, making them very desirable. This example looks to be in excellent condition and is being offered up by a seller who’s featured regularly on these pages, as he often seems to have very rare and very interesting motorcycles available. There is still some time left on the auction and bidding is up north of $37,000 although the reserve has not been met which is no surprise, given the condition and rarity of this SFC.